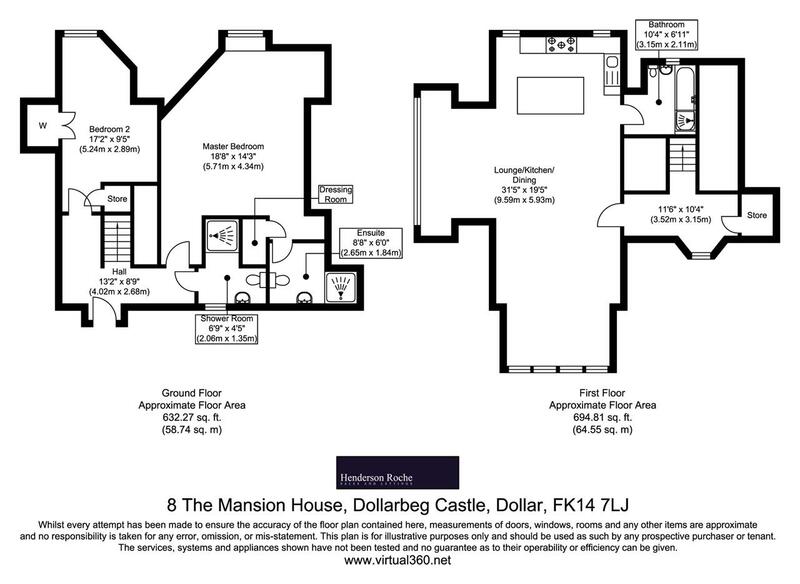 Henderson Roche are delighted to bring to the market this stunning two bedroom Mews House located in the beautiful historic building of The Mansion House at Dollarbeg. 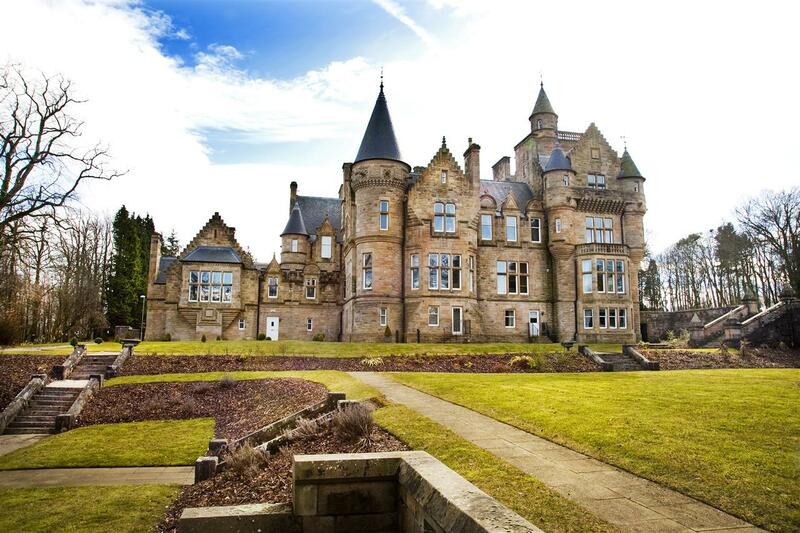 Lavishly constructed around 1890 for the tobacco merchant Henry Dobbie, the house was fully renovated by Manor Kingdom in 2007 to create 10 luxury apartments. 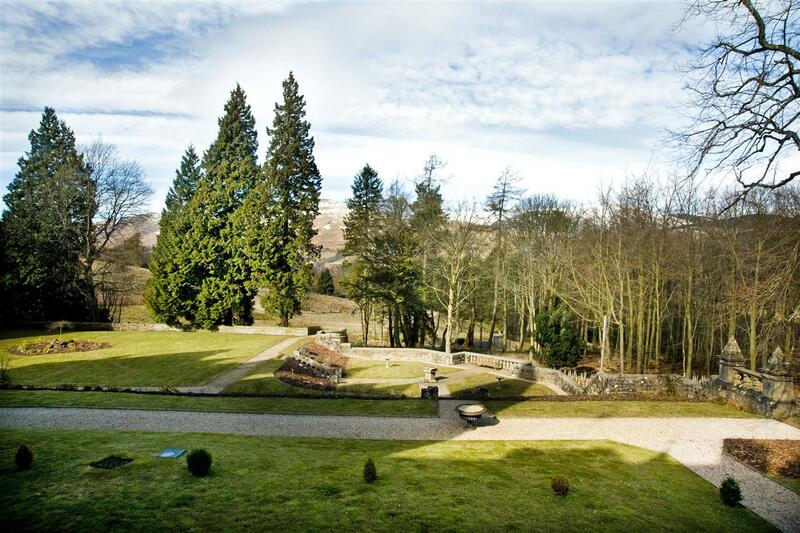 Number 8 has stunning views of the garden grounds and to the Ochil Hills beyond. This property is being sold as seen with all furniture included and part exchange may be available. 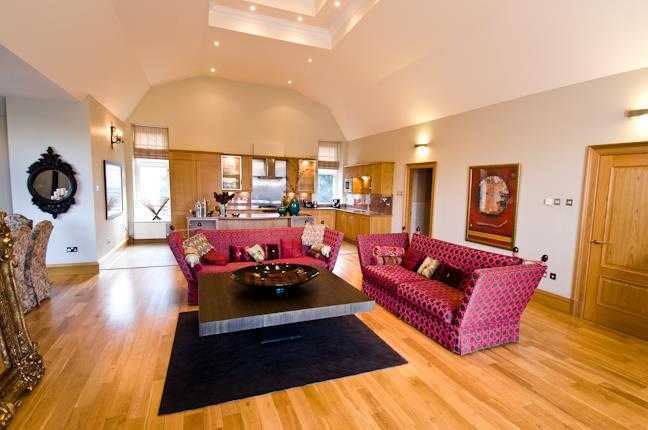 Viewing is highly recommended to fully appreciate this fabulous home. 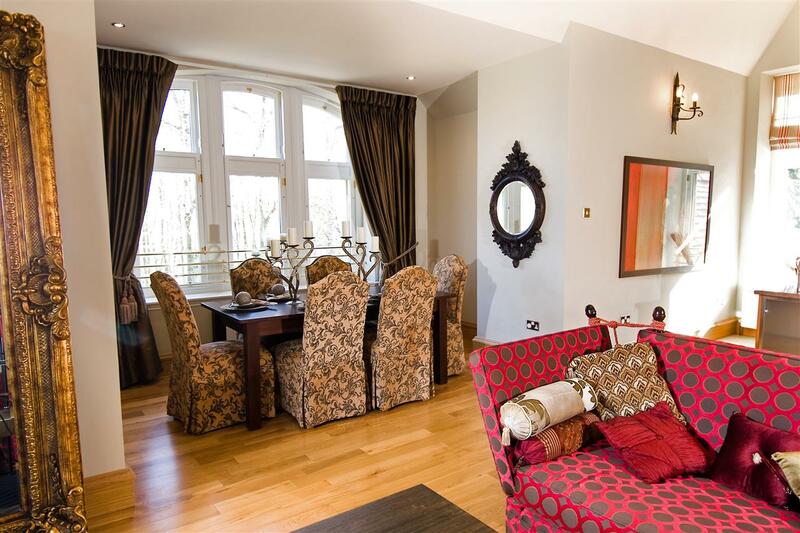 Split over two levels and with its own private entrance, this home benefits from two generous bedrooms on the ground floor and a most impressive open plan living area on the first floor. On entry to the property, there is a welcoming entrance hallway giving access to two double bedrooms and a downstairs shower room. 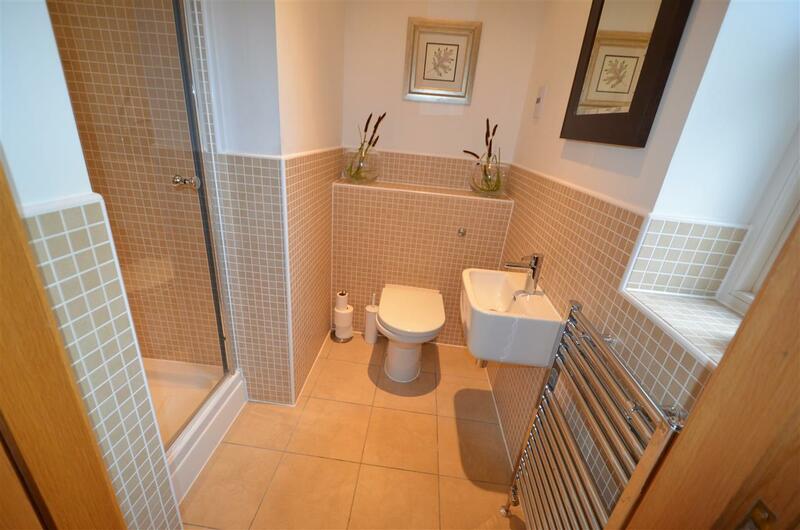 As you would expect with this property, all of the bathrooms are finished to the highest standard. 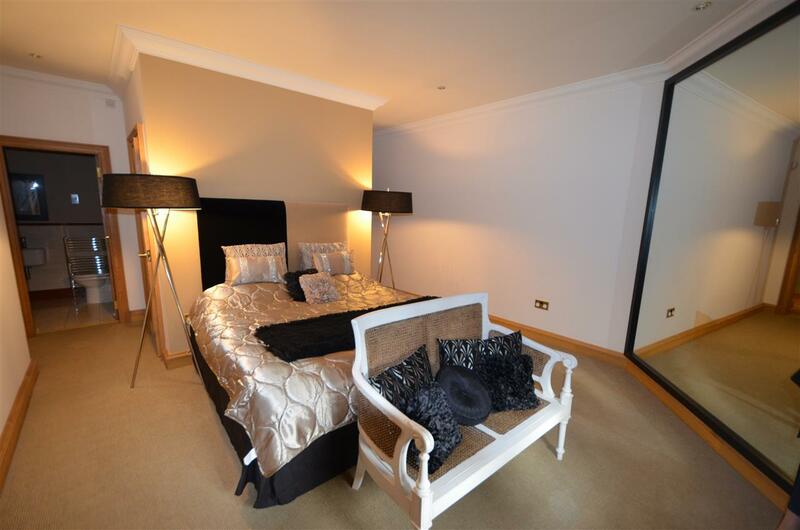 The master bedroom is generous in size and is neutrally decorated, benefiting from an en-suite shower room. 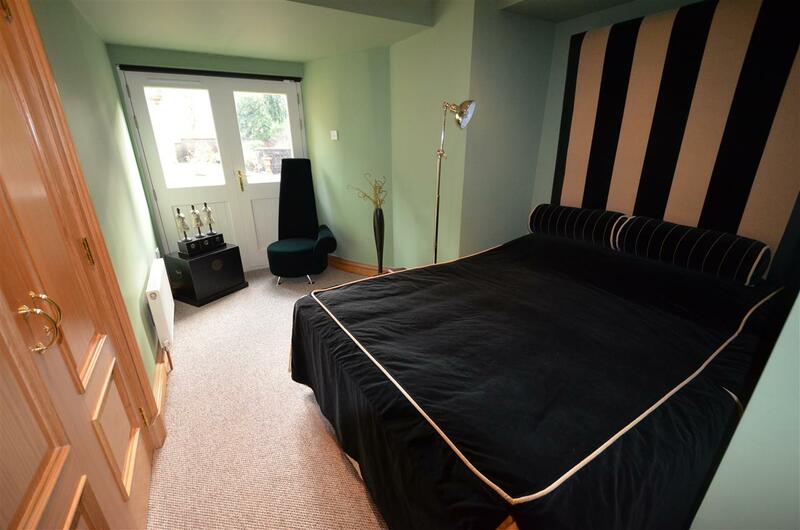 The master bedroom also has a dressing room, which has been fitted with shelving and railing. 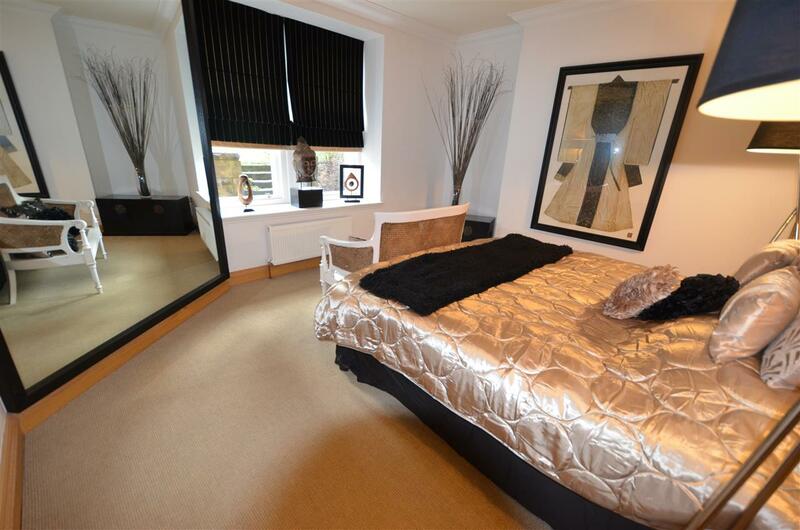 The second bedroom is again a good space with a fitted wardrobe and handy storage cupboard. 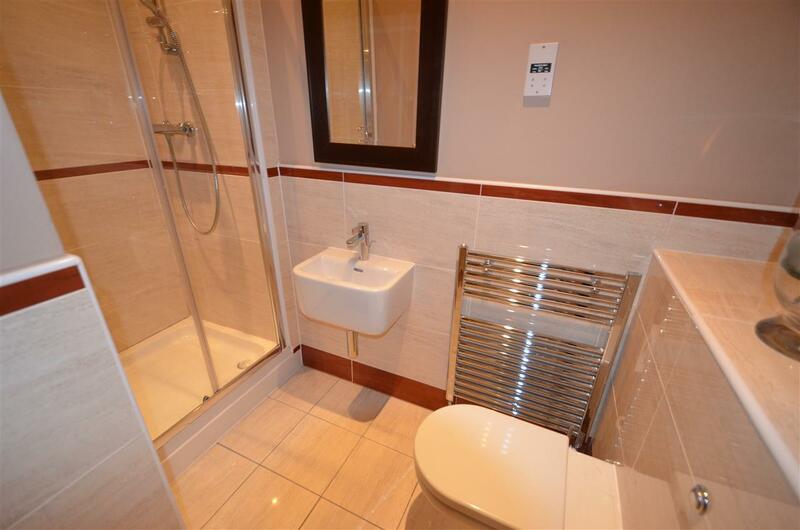 Accommodation on this level is completed with a shower room. 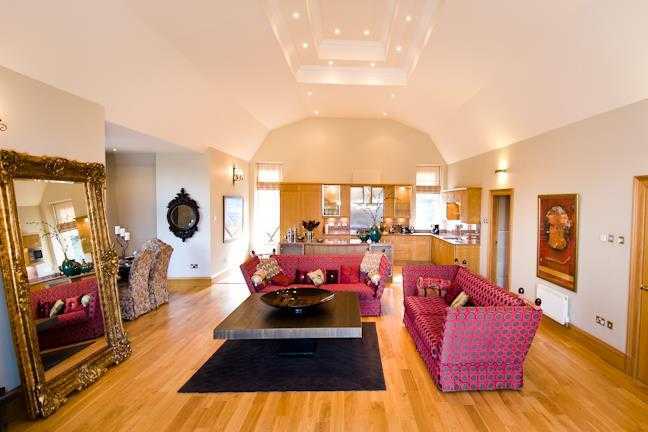 The first floor provides a stunning open plan living space. 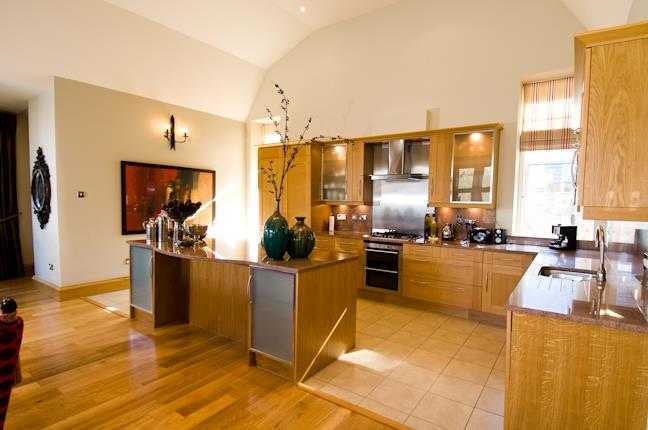 Originally the Great Hall, it has been transformed in to an impressive space to accommodate the kitchen, lounge and dining room. 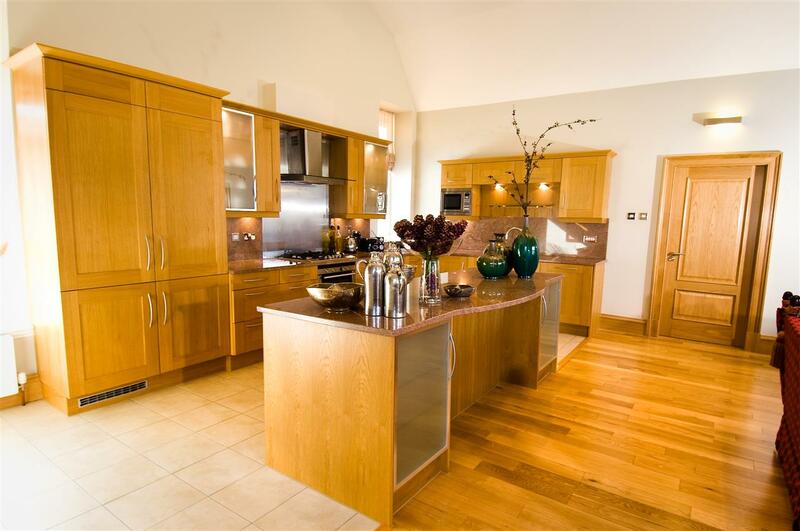 The kitchen is fully fitted with a large island and breakfasting bar, a comprehensive range of wall and base units, beautiful granite worktops and a Belfast sink. Integrated appliances include a Siemens oven, five-ring gas burner hob and stainless steel extractor hood, fridge/freezer and dishwasher. The dining area is created within one of the window recesses, with a beautiful arched window framing the breath-taking views across the castle grounds to the Ochil hills beyond. There is also a raised floor by the main window of the room overlooking the grounds ideal for a cosy armchair and bookcase. At the landing there is a good sized storage cupboard and the first floor accommodation is completed by a family bathroom. 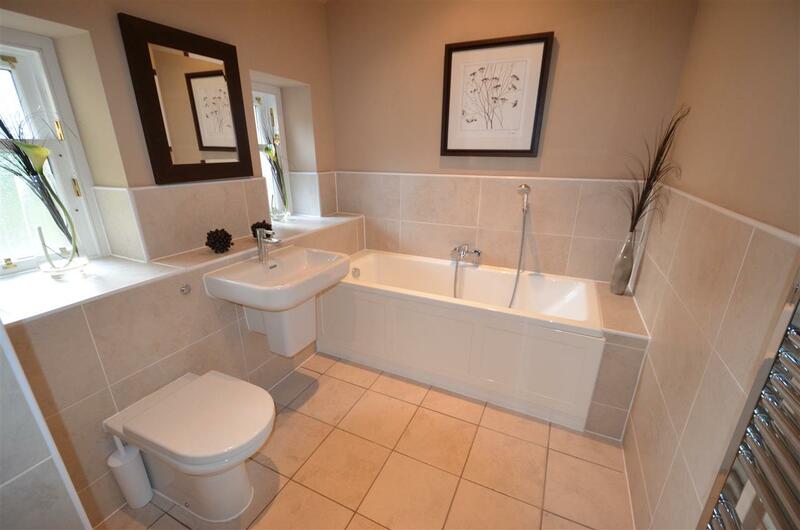 The property is fully double glazed and benefits from gas fire central heating. Externally, the property benefits from residents’ parking along with communal gardens and grounds. This fantastic property is located only a few minutes’ drive from Dollar where a good range of local amenities are available. The Dollar Academy school bus stop is nearby. 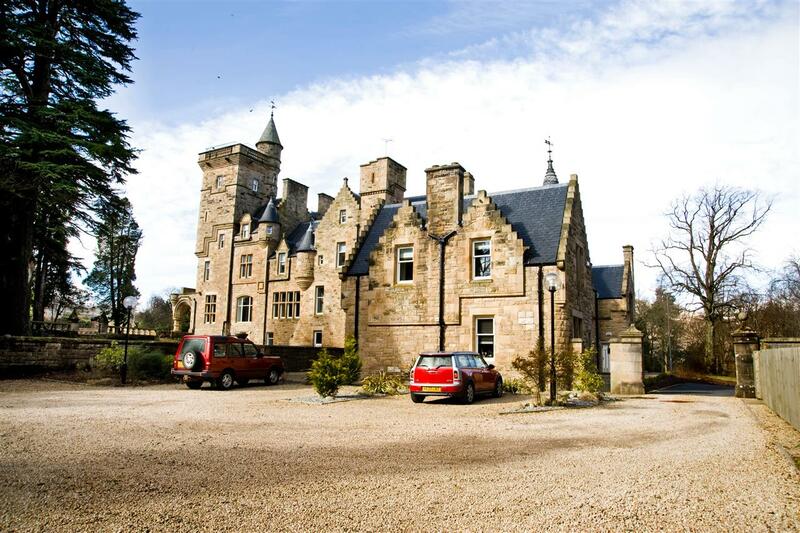 There is excellent access to commuter links and the property is within easy reach of Stirling, Edinburgh, Perth and Glasgow along with the international airports at Edinburgh and Glasgow. 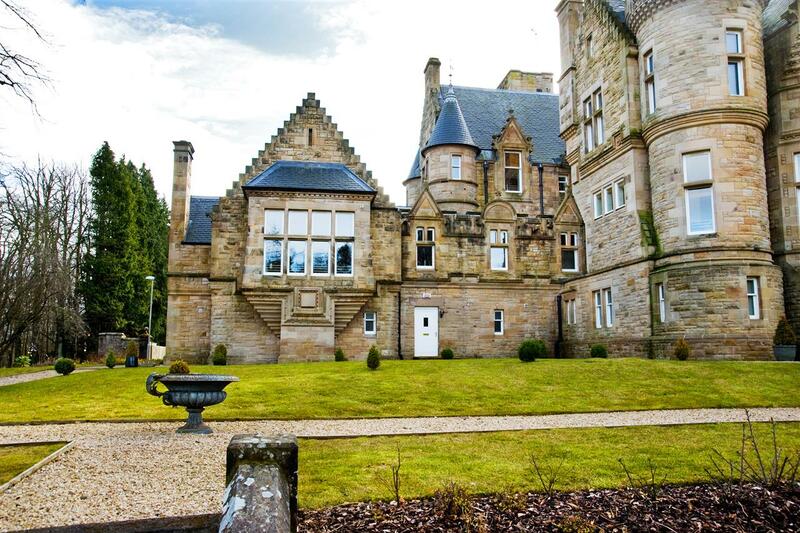 This could also be a great opportunity for investors who want to accommodate golf enthusiasts, sitting around 17 miles from Gleneagles and 40 miles from St. Andrews; this accommodation has previously been let out to some of the world's most famous golfers, who appreciate the luxury and privacy.